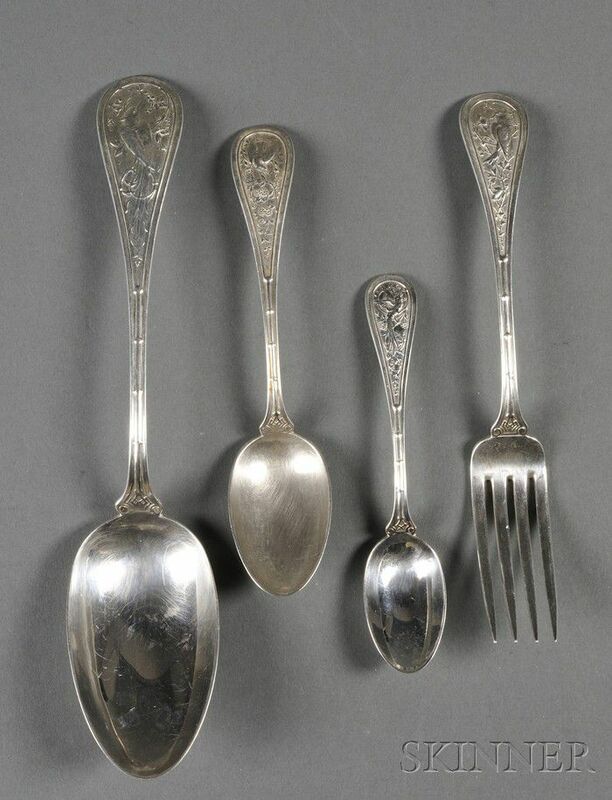 Partial Aesthetic Movement Sterling Bird-patterned Flatware Service, c. 1880, marked only for the retailer William Moir, similar to Whiting "Japanese" pattern, comprising twelve luncheon forks (lg. 6 7/8), eleven teaspoons (lg. 5 7/8), eleven coffee spoons (lg. 4 7/8), and five place spoons (lg. 8 5/8 in. ), monogrammed, approx. 43 troy oz. minor age typical usage wear. 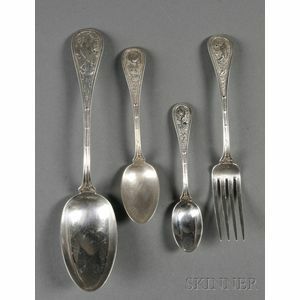 The place spoons engraved with name to back, and with loss of surface crispness from possible machine polishing. marked only William Moir. similar to Whiting "Japanese" pattern.